In LIFEPAC 5th Grade Bible, student's will study about God's powerful presence, His greatness, and the gifts He gives to us. Rewarding and encouraging units discuss: How Others Lived for God, Angels, The Presence of God, The Christian in the World, and Authority and Law. Students will grasp life-changing concepts in this self-paced curriculum that is integrated with mastery-learning techniques and colorful illustrations. Vocabulary words, character qualities, and map reading skills are also taught. 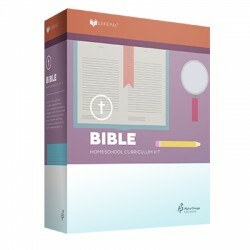 The LIFEPAC 5th Grade Bible Set contains ten worktexts and a teacher's guide. Do you want your children to enjoy studying the Bible? With LIFEPAC Bible homeschool curriculum from Alpha Omega Publications, you can be sure they will! The LIFEPAC 5th Grade Bible Set presents seven major Bible themes in a colorful worktext format for children in fifth grade. Instruction is designed to foster a strong biblical worldview and includes teaching in theology, the attributes of God, biblical literature, biblical geography, Christian growth, and Christian evidences. In the LIFEPAC 5th Grade Bible Set, your homeschool child will engage in studying these themes with teachings from the Old and New Testaments. Using the King James Version, ten engaging worktexts teach lessons on Abraham, a man of faith, the ministry of angels, the presence of God, the Books of the New Testament, learning godly behavior, proving the Bible, the life of Paul, preparing for eternity, and much more. But we didn't stop there! At Alpha Omega Publications, we believe that instilling biblical values into your child's heart is one of the greatest responsibilities of parenthood! And to assist you with this critical duty, we have provided you with an easy-to-follow teacher's guide. This great Alpha Omega curriculum resource contains instructional notes for each unit, a complete answer key, and information about supplemental materials and activities. This additional material will help you individualize the program according to your child's specific interests and needs. Deuteronomy 6:6-7 states, And these words, which I command thee this day, shall be in thine heart: And thou shalt teach them diligently unto thy children. Let the LIFEPAC 5th Grade Bible Set help you fulfill this important command! Order today!